The Mustang is an unconventional tale of redemption that earns its upbeat ending by not falling prey to every cliché of the genre or giving in to the temptation to become too maudlin or sentimental. Although actress-turned-director Laure de Clermont-Tonnerre's feature debut explores the common ground of a violent criminal finding a path to salvation, she approaches the material from an honest, believable perspective. As in real life, deliverance doesn't wipe clean the slate or sluice away the consequences of past misdeeds. 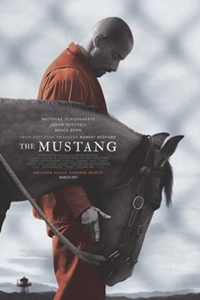 Although The Mustang is a fictional story, the underlying premise is based on an actual program that exists in a small number of maximum security prisons like the Nevada-based one where the film is set. In these facilities, a select group of prisoners are allowed to work with captured wild mustangs with the objective of breaking them and training them so they can be sold at auction. (One of the largest purchaser of these horses is the Department of Homeland Security - they are ridden by officers patrolling the southern border.) De Clermont-Tonnerre, fascinated by this approach to criminal rehabilitation, researched the subject and developed the film, which is loosely based on her earlier short, "Rabbit." The Mustang's main character is Roman Coleman (Matthais Schoenaerts), a pugnacious offender with a hair-trigger temper who is serving a long sentence for a violent act of domestic abuse. With his bulging biceps, shaved pate, and goatee, he looks like a cross between a biker and Dwayne Johnson. Roman is unlikable and introverted with a baleful glare that he directs at everyone except his estranged daughter, Martha (Gideon Adlon), the only person for whom he shows any warmth. It isn't reciprocated, however. Martha's feelings for her father are deeply conflicted. She hasn't completely severed contact with him during his lengthy prison stay (which currently stands at a dozen years) but neither does she eagerly await his eventual return to society. Roman is recruited to work with horses by Myles (Bruce Dern), who almost immediately regrets the decision when Roman loses his temper during a training session and lands several brutal punches to his stallion's side. This earns him a trip to solitary and only after a sincere expression of contrition is he given a second chance. This time, following the advice of fellow inmate Henry (Jason Mitchell), he adopts a more patient, less confrontational approach. As he develops a bond with the horse, he begins the process of confronting the demons that have tormented him, taking steps toward accepting responsibility for his actions and asking for forgiveness. Structurally, The Mustang follows a familiar path but the third act offers surprises in the restrained and believable manner that key events are handled. De Clermont-Tonnerre completes Roman's story arc without resorting to a surge of manipulative melodrama. Her style has a documentary aspect that maintains a distance from the character while at the same time providing the viewer with an emotional hook into Roman's psyche. We don't see the act that landed him in prison but he describes it in gruesome detail. The Mustang doesn't pretend that he's a virtuous person or was somehow wrongly imprisoned. He's guilty of the crime but that doesn't prevent us from empathizing with him once he begins a crawl toward the light. Although the primary actors - Matthias Schoenaerts, Jason Mitchell, Bruce Dern, Gideon Adlon, and Connie Britton - are professionals, de Clermont-Tonnerre recruited a number of former participants in the program to fill supporting roles. Their presence lends a degree of authenticity to the proceedings. Schoenaerts shines with a perfectly calibrated performance that shows growth and Bruce Dern hasn't been this good since Nebraska. If there's a fault in the screenplay, it's the introduction of an antagonistic relationship between Roman and his cellmate (Josh Stewart). This never fully gels and there are times when it seems more an effort to provide a source of tension than something organic to Roman's situation. Focus Features is according The Mustang only a limited distribution, so it will be easy to miss. It's worth seeking out, however, as both a portrait of a prison program few are aware of and a powerful character study.